We all know that nuts are wholesome and nutritious. Indeed, they’re crammed with valuable nutrients, including protein, fibre, vitamins and minerals. US researchers have demonstrated that eating just 28 grams of nuts 7 or more times per week is linked to a 20% reduced risk of death, whilst other studies have specifically linked nut consumption to a decreased risk of chronic disease, such as heart disease, type 2 diabetes and even certain types of cancer. However, US scientists have recently revealed that there is one type of nut that outclasses all others when it comes to offering exceptional benefits for our health – walnuts. Walnuts are a variety of stone fruit that grow on the walnut tree (Juglans) – a deciduous tree that can reach 10 to 40 metres in height and thrives in the temperate climates of South East Europe, the Middle East, Asia, Canada, the United States and Argentina. The name walnut is derived from an old English word “wealhhnutu”, which means ‘foreign nut’. 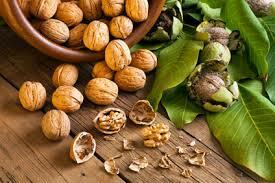 The two most common species of walnuts are the Persian (or ‘English Walnut’) and the Black Walnut. In China, walnut pairs are traditionally rotated in the palm of the hand to promote blood circulation or as a show of ‘status’. Old symmetrically shaped walnuts are highly prized and are even used as a financial investment that can yield tens of thousands of dollars! Walnuts really are tough nuts to crack – when ripe, the round, single-seeded stone fruits boast a tough husk and an extremely hard shell. This hardy shell encloses the precious, oil-rich, nutrient-dense kernel, which consists of two halves encased in a soft brown coat that’s extraordinarily high in antioxidants. US scientists claim that walnuts are the healthiest nuts of all (healthier even than peanuts, almonds, pecans and pistachios), and have advised us to start including more of them in our diet. So, what exactly makes walnuts such a powerful superfood and why are they so beneficial for our health and wellbeing? According to Scientists from Pennsylvania, walnuts contain the highest level of antioxidants of any nut. Antioxidants boost your immunity by inhibiting the oxidation of molecules, thus preventing, repairing or even reversing the type of damage caused by free radicals, such as aging. Antioxidants are also linked to a reduced risk of heart disease, stroke, cancer, arthritis, macular degeneration and Alzheimer’s disease. Walnuts are extremely rich in omega-3 fatty acids and in particular, heart-healthy alpha-linolenic acid (ALA) – in fact, eating just four walnuts per day can significantly raise your ALA blood levels. Also known as polyunsaturated fatty acids, omega-3 fatty acids improve cell response to insulin and neurotransmitters, support the repair process of cells, play an integral role in brain function and are crucial for healthy growth and development. Reduce your risk of heart disease (Delgado-Lista et al., 2012; Von Schacky, 2003; Morris et al., 1993). Research also indicates that those who eat a diet high in ALA are less likely to suffer a fatal heart attack and have a nearly 50 percent reduced risk of sudden cardiac death. Furthermore, the beneficial dietary fat in walnuts has been proven to improve metabolic parameters in those with Type 2 diabetes. Protein is required for the healthy growth and repair of your body tissue, internal organs and skin. In combination with regular exercise protein also helps to build lean muscle mass, increase metabolic rate and ultimately burn fat for demonstrable weight loss. The protein in walnuts additionally supplies essential amino acids, including l-arginine – an amino acid that offers multiple vascular benefits to those suffering from heart disease, or those at an increased risk of heart disease. According to the NHS most of us only obtain 14 of the recommended 18 grams of fibre per day. Walnuts contain almost 7 grams of fibre per every 100 grams and are thus an excellent way of demonstrably boosting your fibre intake. Prevent weight gain and obesity – eating walnuts is associated with increased satiety and adding regular quantities of nuts, such as walnuts, to your daily diet can help you to sustain your ideal body weight, long term. Adequate fibre intake is also believed to help prevent a number of chronic diseases, such as heart disease, diabetes and certain types of cancer, including colorectal cancer. Vitamins – A, C, E and K. In particular, walnuts provide an unusually high level of vitamin E in the form of gamma-tocopherol, which has been found to provide welcome protection from heart disease. Minerals – such as phosphorus, magnesium, calcium, iron, and zinc. To enjoy optimal health benefits from walnuts, it’s best to choose for raw, organic walnuts that haven’t lost any of their naturally occurring nutrients due to roasting or other types of processing. And always resist the temptation to remove the skin, as this contains up to 90 percent of their antioxidants! Organic walnuts make an extremely delicious, yet thoroughly sensible snack between meals and can be enjoyed straight from the bag or as an additional ingredient in breakfast granola, trail mix and homemade raw chocolate bars, biscuits and cakes. Tags: buy organic walnuts online, buy rawfoods online, buy superfoods online, buy walnuts online, health benefits of walnuts, walnuts antioxidants, walnuts health benefits, walnuts omega-3 fatty acids, walnuts the healthiest nut, what is the healthiest nut? ← Superfood energy – fuel for life!